For many charities, volunteers are important and invaluable resources. They help in fundraising and administrative duties, and some in the running and delivery of services. 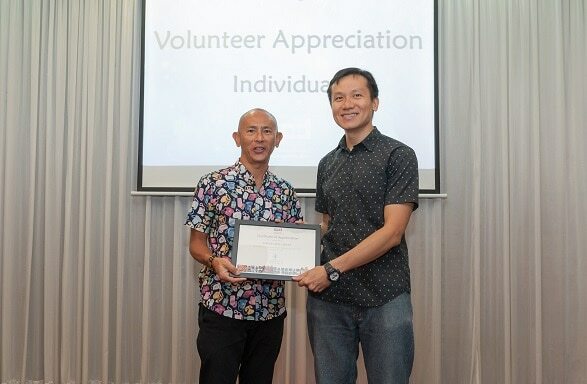 We spoke to two of our long-time volunteers, Mdm Agnes Chiew and Mr Francis Phoon, who are passionate about giving back to society. 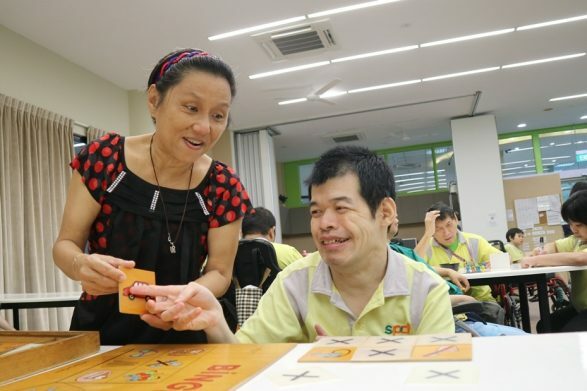 Mdm Agnes Chiew, 65, is a retiree who devotes her time volunteering and Mr Francis Phoon, 54, took his time off his business regularly to spend time with our Day Activity Centre (DAC) clients at the hydrotherapy programme. 1) How have you been helping out at SPD? Agnes: Most of the time, I help out with the logistics for SPD’s fundraising events. For example, getting the donation tins and stickers ready for Flag Day and preparing boxes for the collection of the SPD Charity Hongbao’s red packets. Twice a month, I would also help to collect the money that has been dropped into the donation boxes placed at various commercial outlets. Francis: I help out every Friday at the Day Activity Centre (DAC) during their hydrotherapy programme. We take five or more clients to the Delta Swimming Complex every time. The pool games and exercises help the clients to strengthen weak muscles or soothe stiffness while having fun. 2) What prompted you to volunteer and why? Agnes: It started after I searched the internet for volunteering opportunities many years ago. I helped out at an event organised by the Freedom Adventure Club, an interest group managed by a group of volunteers that organises outdoor and physical-based activities for SPD clients. We took the clients outdoors as some of them may not have the chance to do so on their own. There, I met an SPD staff who told me about the work they do and how I could help. I began volunteering at SPD in 2013. It can be challenging for organisations to find volunteers who could commit their time on weekdays. As I am retired, I can spare the weekdays. Moreover, my children are grown up and they are supportive of me doing volunteer work. Francis: As much as my time permits, I hope to see the smiling faces of the clients when I volunteer. 3) What is the best part of volunteering? Agnes: I also volunteer at SPD’s Day Activity Centre (DAC). I am involved in feeding the clients at meal time and sometimes I would join the staff in taking the clients out to the nearby park or market. I think more volunteers are needed so that there could be more opportunities for the clients to go outdoors. I am happy that I could contribute. As I am a regular, the clients recognise and are familiar with me. I feel touched that they remember me and would ask after me on occasions when I did not visit them. Francis: Seeing the clients’ smiling faces make my life happier. Every time they smile, it makes it memorable. 4) What is the most challenging part? Agnes: I have met with individuals who were unwell. At times, they might lose their temper and lash out at volunteers. However, I would remain calm, give them a smile and lend them a listening ear. You need to put yourself in their shoes. They were frustrated because of their situation or condition. As a volunteer, if you get angry over this, it does not help the person or the situation. Francis: Seven to eight of us help out at the hydrotherapy programme. As the public pools would be closed during bad weather, there were days when we felt quite anxious when we were on our way to the Delta Swimming Complex, as the programme could not go on if the weather was not good. I think this is the most challenging part for us volunteers. 5) Any words of encouragement or further comments you would like to share? Agnes: Through volunteering, I learnt to give more love, show more kindness and have more patience. It is also a good experience meeting different people. Hence, I would like to encourage others to volunteer with love, volunteer with kindness and volunteer with patience! Francis: I hope there could be more efforts and manpower (from volunteers), as we were told that lessons were cancelled at times due to shortage of manpower. If possible, it would be good to look for a sheltered swimming pool that is weather-proof. Personally, I admire a few of SPD staff who know the clients and their family background well. They are really committed in their job. 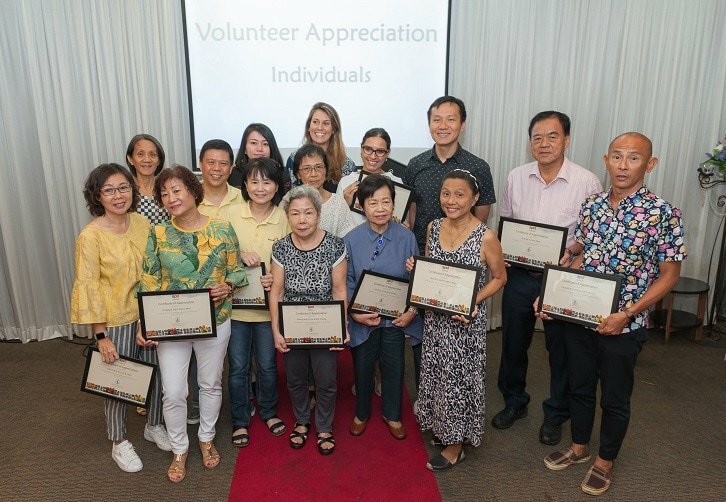 We thank our volunteers for their contributions and look forward to impacting more lives together.